CEO, Star India Pvt. 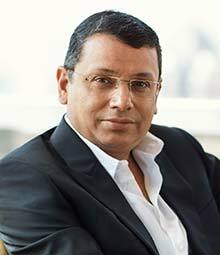 Ltd.
Uday Shankar is the CEO of Star India, one of the largest media and entertainment companies in India that operates more than 50 channels in 8 languages, including its flagship channel, Star Plus. The Star network enjoys market leadership in key geographies, demographics, and time slots reaching more than 650 million viewers in 100 countries every week. Uday Shankar has guided the transformation of Star India into a diversified media company, leading initiatives in distribution through Media Pro, movies through Fox Star Studios and regional television through Asianet and Maa. He initiated the consolidation of the network with its sports broadcasting operations with 21st Century Fox’s acquisition of its joint venture with ESPN. He is also leading Star India’s foray into future-looking businesses like Hotstar, the digital entertainment platform and the Pro-Kabaddi League, where Star has equity interest. His tenure is marked by relentless innovation in media and programming, setting benchmarks for the industry. He was honored in 2015 by Forbes India Leadership Awards as the best CEO amongst chief executives of multinational companies. Uday Shankar is also a leading voice in the media and broadcasting industry in India today, championing reforms for the industry and its consumers. As President of the Indian Broadcasting Forum (IBF) and as Chairman of the FICCI Media & Entertainment Committee, Uday has been at the forefront of landmark changes in self-regulation and ensuring access for consumers to digitized distribution.